Many have described Samuel Moaz’s Lebanon as the Das Boot of tank movies, and although this is certainly an apt description, the comparison that immediately jumped to my mind was Apocalypse Now. Moaz’s film distills and highlights the sense that war is indeed hell and very successfully expresses the madness and darkness that overtake men as they enter into battle. 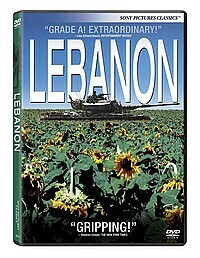 Lebanon unfolds entirely inside the cramped, dark, dirty guts of an Israeli tank plodding its way through the 1982 war in Lebanon, closely acquainting us with the young soldiers who man it during their first two days of combat. Stuck inside the tank, the viewer feels as trapped as the characters surely must feel. But rather than being a gimmick, this sensation becomes central to the film’s emotional impact. The camera lingers for long poignant moments over the dank walls of the machine, dripping with motor oil and grime. It forces us to gaze through the gun sight into the faces of Lebanese civilians and Israeli soldiers who gaze right back with stark condemnation of our violence and our cowardice alike. We can’t escape the gore and terror and insanity that build as the mission crumbles and all the characters’ wills are stretched inexorably to the breaking point. Lebanon is about Israelis versus Arabs, but it is decidedly apolitical and could really be about anyone’s war. It does not glorify war; rather it vilifies it, making war itself into the only true antagonist in a conflict in which no one can clearly be called the villain. Not everyone will like this film, but everyone will understand its message. The DVD’s one special feature is a 25-minute making-of featurette that reveals the creativity and cleverness that went into filming a movie that takes place in such small quarters.